New portable bleachers have been installed at the south end of the pool at Spieker Aquatics Complex — and for some disabled individuals, this raises concerns about access to the pool. 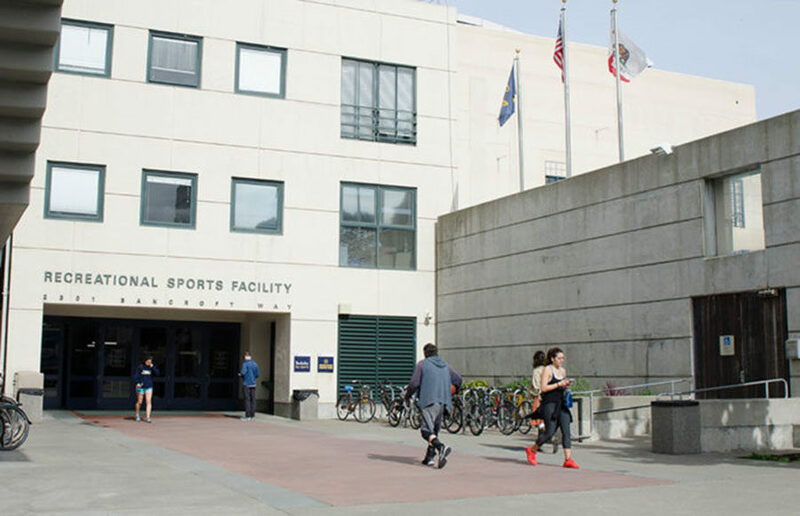 After UC Berkeley Chancellor Carol Christ announced ambitious plans to increase the school’s Hispanic student population, the Asian American Coalition for Education sent a letter to Christ denouncing this plan Aug. 30. More than 140 people came to Cheit Hall to hear King speak about the day-to-day challenges of putting together a show in less than a week as well as his experiences from working in the entertainment industry for his entire life. The Stop Urban Shield Coalition organized the rally to coincide with the final scenario exercises and vendor exhibitions of Urban Shield taking place this weekend, according to Jennifer Abella, a Gabriela Oakland member and Stop Urban Shield Coalition organizer. The rally also coincided with the People’s Climate March in San Francisco this Saturday. A Chinese restaurant has been approved to move into the 2142 Center St. space, Berkeleyside reported. Guacamole 61’s Shattuck Avenue location is still open. When installed, the user hovers over the image in question, and SurfSafe instantly cross-checks it with images in its database to determine if there is a match, according to Kyle Rentschler, a SurfSafe product engineer and campus senior. The Commons includes a 12-laptop lending self-service machine, various comfortable seating and table options and more power outlets for charging, according to Elliot Warren, the acting director of Library Services. There were various groups of people partaking in different events at the park during the time of the shooting, according to Berkeley Police Chief Andrew Greenwood. The City of Berkeley will invest $2.45 million in park improvements according to Davila. Margaret Wade, who co-owns Brennan’s with her brother and has worked there for more than 26 years, said the restaurant is closing because of a 25 percent rent increase on the building and a general dip in business.